← Is This Minnesota or Florida? They failed to do anything about the $500 gusset plates because Pawlenty held the line on taxation. Clem, I don’t know if lack of adequate bridge financing is the reason for the gap I describe here. But I do think we have to ponder this question: Why were the Hastings and St. Cloud bridges closed and replaced immediately after the Legislature overturned the Governor’s gas tax veto, but not before? That seems to be a rather glaring omission. Even if it’s not in the intended scope of this report, why haven’t these questions — Why wasn’t anything done about it? Etc. — been formally addressed elsewhere? Joe: Why were the Hastings and St. Cloud bridges closed and replaced immediately after the Legislature overturned the Governor’s gas tax veto, but not before? It’s obvious: Replacement gusset plates don’t buy votes – new pork projects do. You think so little of Pawlenty and his appointed Commissioner? 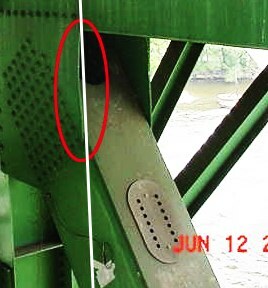 You really think Pawlenty would needlessly throw $135 million at those bridges strictly to “buy votes,” when spending a few thousand on new gusset plates do the trick? I give Pawlenty a whole lot more credit than that.